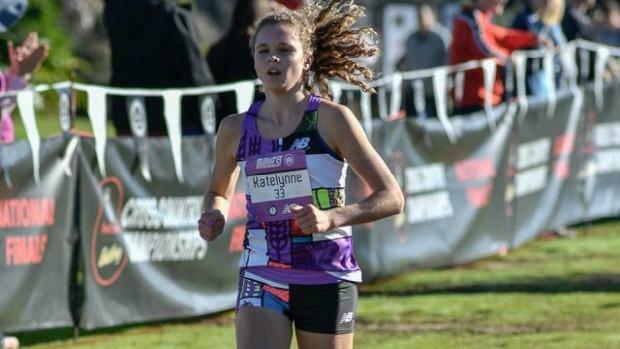 Who would have thought Glenbard West IL junior Katelynne Hart would have the greatest cross country race in her life in December? It is incredibly hard to keep a peak when you start your season the first weekend in September. Hart has been marvelous throughout her career and 2018 was expected to be just as special. But this year was different for some reason. Starting one's harrier season in early autumn isn't a big deal for the nation's top runners, but the way Hart navigated her way through it is. It seemed by the naked eye and by her account that she did enough to win and to show dominance simultaneously. In first two meets of the season, she won the Lake Park and Peoria Richard Spring Invitationals by 37 and 32 seconds respectively. Still, there were some pundits questioning why Hart was not more dominating. "I usually worry about myself... I really hope to have a long season," said Hart back in September in reference to staying locked in on her goals. Coming into the Footlocker final were first, third, and sixteenth place finishes over 5000m. The terrain and weather were different in each locale. Terre Haute was cool with rolling hills, Kenosha had mud and cold, and Portland was wet with stretches of challenging inclines. San Diego is considered the paradise for late season racing with sunny climes- not too hot and certainly not too cool. Balboa Park has its share of uphill and downhill racing that elite runners must conquer. Would Hart pass the test? Right off the gun and before the first minute was in the book, Hart led a pack of chasing Midwest "teammates" following closely behind. The first half mile was in 2:32- a fast opener before the hills would kick in. It was at the first mile led by Hart in 5:13.9 that things became real. There was no point in turning back now as Taylor Ewert (OH), Emily Covert (MN), Abby Vanderkooi (MI), and Ericka Vanderlende (MI) all within two seconds. Lurking behind the Midwest shield was sophomore Sydney Masciarelli of Marianapolis Prep School in Connecticut. Masciarelli came in "fresh" and rested after running a light schedule and not racing since the Northeast regional championship. She is a "dual threat" of her own with basketball dreams after cross country. The fact that Masciarelli turned down an at-large Nike Cross Nationals bid meant that it was all or nothing for San Diego. Hart continued to lead the field at two miles in 10:50- Masciarelli moved into second and five seconds back. The rest of the group began to slip back as it appeared obvious that either Hart or Masciarelli would be the eventual winner. Hart and Masciarelli were dead even at three miles in 16:27. It was already determined that footspeed and mind strength would settle this classic race. Both girls had one bullet in the chamber left. Hart shot first and missed with 50 meters left. Marsciarelli let hers off and bullseye, she hit the tape first in a personal best 17:00.3. Hart's heartbreaking but later jubilant runner-up spot was a personal best 17:01.0. It was also great times for the often overlooked Midwest teams who frequently do well collectively in national competition. This time it was not even close as the collective group from America's heartland scored a scant 20 points= 2,3,4,5,6,(10),(15). All seven runners were in the top 15 of the 40 girl field. Naperville North senior Alex Morris had run in the top 10 for much of the race, finished a very respectable 15th overall in 18:02.2.